At Forest River RV, we want you to get the most out of your RV, so we have provided useful programs and tools for our owners to help enhance the ownership experience. From one FREE year of Roadside Assistance, to Digital Owners Manuals and FREE membership in Forest River Owner’s Group (FROG), Forest RV is dedicated to enabling our owners to experience all the beauty that Mother Nature has to offer. Visit our dynamic online manual to enhance your ownership experience. 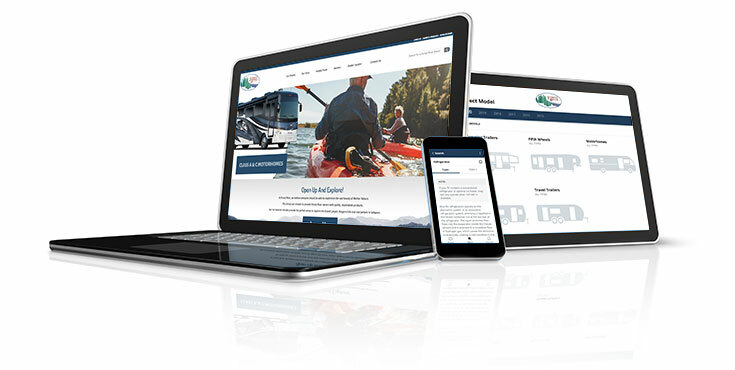 This interactive option provides incredible ease and insight into use, maintenance and enjoyment of your Forest River RV product. Ranging from “How-To” videos, pictures and illustrations of various components, systems and features to fully searchable content and downloadable PDFs for individual component owner’s manuals, answers are always just a click away. Thank you for purchasing a recreational vehicle from Forest River RV. At Forest River we understand that the quality and dependability of our products is of the utmost importance, and we back them up with a limited warranty. These warranties are found within our dynamic online manual Owner’s Manuals. We have also provided direct links below for your convenience. If at any time the need arises to speak with a warranty representative about issues with your Forest River RV, please find phone numbers and e-mail information on our Contact Us page. Thank you for purchasing a Forest River RV and placing your confidence in our Company. We understand your expectations of a trouble free and rewarding ownership experience and we are committed to standing behind our product, providing you with the service you expect and deserve. Please be sure to first direct your product questions or concerns to the appropriate Forest River Team Members in our Contact Us portal. When you purchase a new Forest River RV, you and your family will travel safely with a one-year complimentary roadside assistance membership. Your Roadside Assistance membership includes emergency roadside assistance services such as towing, winch-out, jump-starts, tire changes, technical support, and more. Learn more about the benefits and features of your Roadside Assistance membership below. Visit www.forestriveraccessories.com to browse all of our products, including name brand apparel like Under Armour, Nike, Ogio and Eddie Bauer.